Anyone who doesn’t feel like dealing with Toronto’s cold, windy winter weather, or who might want to avoid a downpour while spending time in the city’s downtown core (which can be notoriously windy any time of year), can avoid going outdoors thanks to Toronto’s extensive PATH system, a vast underground walkway that allows users to traverse a large portion of the downtown area while staying indoors. According to Guinness World Records, PATH is the largest underground shopping complex with 30 kilometers (19 miles) of shopping, services, and entertainment. Over 200,000 commuters use the PATH on any given business day to get around and make use of the system’s more than 1,200 shops and services. More than 50 buildings and office towers are connected through PATH, as well as six of the city’s subway stations - making it a convenient option for not just avoiding the cold, but for shopping as well. The beginning of the PATH goes all the way back to 1900. This is when the T Eaton Co. joined its main store at 178 Yonge St. to its bargain annex by tunnels. Slowly but surely, more tunnels were added and by 1917, five tunnels were available in the downtown core. It wasn’t until the 1970s however that the PATH had a real growth spurt, when a tunnel was built to connect the Richmond-Adelaide and Sheraton Canters. Today, the PATH stretches for a whopping 30 kilometers (19 miles). The PATH doesn’t follow the city grid, which can make for some confusion, especially for those who aren’t familiar with the downtown area. Getting around the PATH can be difficult at times and often feels like trying to make your way through a maze, but it can be done. There are more than 125 entrances to the PATH on street level, six of which are connected to subway stations. In terms of getting around, there are color-coded signs at almost every intersection along PATH, telling you which direction you’re heading in, as well as any relevant landmarks nearby. On the PATH Map, squares represent buildings, green lines represent links between and through buildings, stars indicate tourist attractions, H indicates a hotel, S indicates a sports venue, C indicates a cultural building and colors represent the four points of the compass - north (blue), south (red), east (yellow), and west (orange). 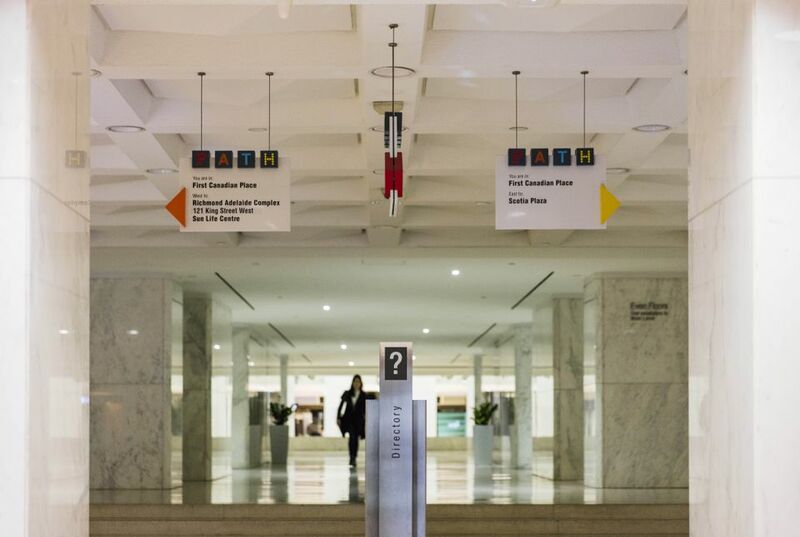 As you navigate the PATH, directional signs tell you which building you’re in and the next building you’ll be entering. The arrow is one of the PATH compass colors mentioned above. If all else fails, ask directions so you don’t end up going too far out of your way. Hungry in the PATH? Not to worry. There are numerous places to get something to eat or drink in both casual and more upscale settings. There are many options for coffee, quick meals and snacks, healthy and vegetarian food, fine dining, and spots to get a beer or glass of wine. Head to Sam James Coffee Bar for some of the best coffee in the city, fill up on vegan and gluten-free fare courtesy of Kupfert and Kim, treat yourself to a French pastry at Nadege, stock up on gourmet groceries and specialty foods and takeout options at McEwan or Saks Food Hall, settle in for some after-work cocktails and sharable appetizers at Speakeasy 21, or have a gourmet meal at Bymark or Katana. No matter what you’re in need of—be it gifts, groceries, a spa treatment, or a new pair of shoes—you can find it in the PATH. You can find health services here in the form of dental clinics, pharmacies, gyms and doctor’s offices. Personal care and grooming services come in the form of spas, hair salons, and barber shops. If you’re looking for retail therapy, options abound and include men’s and women’s fashion and accessories, jewelery, florists, Godiva chocolates, and The Body Shop (just to name a few). Toronto’s PATH is also connected to the CF Toronto Eaton Centre, home to more than 250 shops, restaurants, and services. PATH provides covered access to many of Toronto’s major tourist attractions and downtown hotels. Use the PATH to find your way into the Hockey Hall of Fame, Ripley’s Aquarium of Canada, Air Canada Centre, CF Toronto Eaton Centre, Rogers Centre and the CN Tower. In terms of hotels, the PATH gets you access to some of the best places to rest your head in the city, including One King West, Ritz-Carlton Toronto, Hilton Toronto, Sheraton Centre Hotel Toronto (home to the largest indoor-outdoor pool in Toronto) and Westin Harbour Castle.